"The title "Psychic Warfare" is taken from the track "X-Ray Visions". It's a tale of an unnamed protagonist who is forced to seek refuge in a flop house motel. He is hiding from several nefarious psychic forces, the worst of which is his own sleep deprived paranoia", says Neil Fallon. 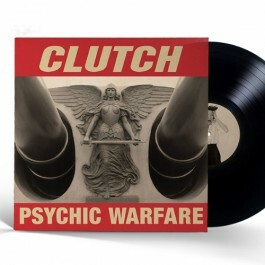 "Psychic Warfare" is Clutch's follow-up to the hugely successful "Earth Rocker". That album entered the Billboard Top 200 chart at #15, and reached #1 on the Rock Chart and #4 on iTunes' overall Top 100. "Earth Rocker" was awarded Album Of The Year by Metal Hammer and garnered a Top 10 spot on Rolling Stone's "Top 20 Metal Albums of the Year." Rolling Stone further enthused: "Four Maryland lifers - road dogs who've been grinding it since the early Fugazi administration, cranking out seething admixtures of jam-band chops, careening blues-punk riffs and singer Neil Fallon's nerdy, piss-taking wiseass lyrics - release their hardest rocking set to date." "Psychic Warfare" picks up where "Earth Rocker" left off and Clutch are in the groove yet again. This engine runs on all cylinders.